Over the last three decades much research in empirical and theoretical economics has been carried on under various assumptions. For example a parametric functional form of the regression model, the heteroskedasticity, and the autocorrelation is always as- sumed, usually linear. Also, the errors are assumed to follow certain parametric distri- butions, often normal. A disadvantage of parametric econometrics based on these assumptions is that it may not be robust to the slight data inconsistency with the particular parametric specification. Indeed any misspecification in the functional form may lead to erroneous conclusions. In view of these problems, recently there has been significant interest in 'the semiparametric/nonparametric approaches to econometrics. 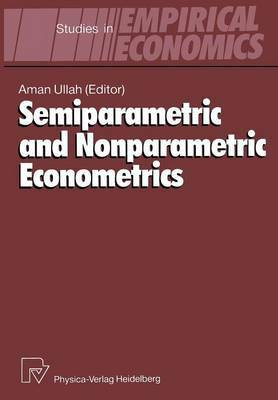 The semiparametric approach considers econometric models where one component has a parametric and the other, which is unknown, a nonparametric specification (Manski 1984 and Horowitz and Neumann 1987, among others). The purely non- parametric approach, on the other hand, does not specify any component of the model a priori. The main ingredient of this approach is the data based estimation of the unknown joint density due to Rosenblatt (1956). Since then, especially in the last decade, a vast amount of literature has appeared on nonparametric estimation in statistics journals. However, this literature is mostly highly technical and this may partly be the reason why very little is known about it in econometrics, although see Bierens (1987) and Ullah (1988).